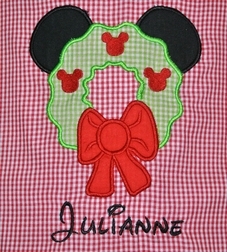 This is our wonderful Minnie Mouse Christmas Wreath dress OR 2 piece outfit. The dress/top is made with the sweet and simple red gingham fabric. The shoulder straps fasten with lime green gingham covered buttons. 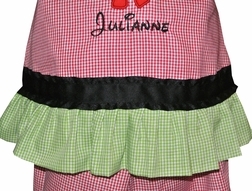 Lime green gingham is also used to make a large fluffy ruffle at the hem of the dress/top. Just above the ruffle is black ruffle edge, slight sheened ribbon. 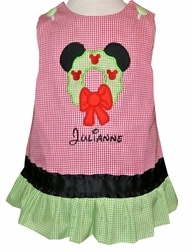 The dress/top is appliqued with a pretty Christmas wreath in lime green gingham, decorated with Minnie Mouse ears, little red mouse heads OR a monogram, and a big red bow. You can also choose to have just the dress with the Minnie heads in the wreath with no monogram, 3 initials in the wreath instead of Minnie heads, OR Minnie heads in the wreath with a name underneath. The trousers, if chosen, are made in your choice of length, and are made from the red gingham and also have the lime green gingham ruffle and black ribbon.